Peaceful weather is on tap to begin the week. Temperatures will slowly moderate back to average. 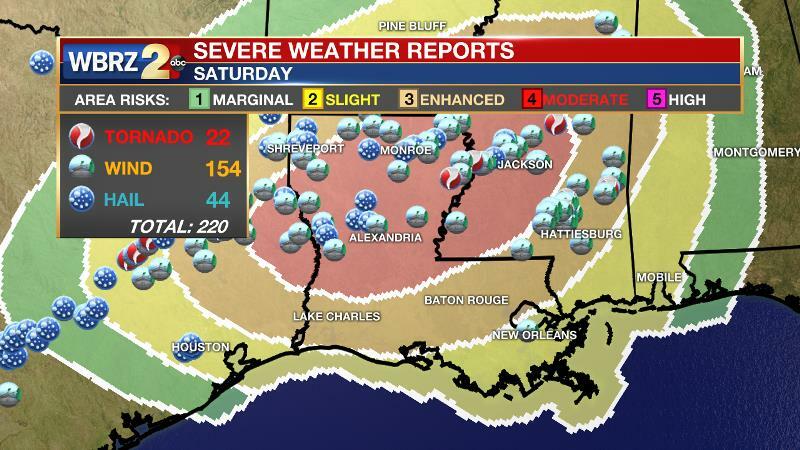 In review of Saturday’s severe weather, the system certainly produced but by “moderate risk” standards, it could have been much worse. Much of the action was confined to the moderate risk area and the local forecast area was largely spared, which is a bit unusual for an “enhanced risk” area. The ingredients were most certainly there and given a similar setup, the same forecast would be issued. Beyond some pre-frontal gusty wind damage, not much occurred. Today and Tonight: Surface high pressure will continue its reign over the local area, keeping clear skies in the forecast. Temperatures will quickly warm through the morning, with highs peaking around 77 later this afternoon. Overnight will stay clear with lows near 51. Up Next: High temperatures will slowly warm back into the 80s on Tuesday, but high clouds will begin to build late Tuesday into Wednesday. These will be associated with an approaching frontal system that will push showers and thunderstorms into the area on Thursday. Once again, some strong storms appear possible but this threat looks a bit lower than what we faced last weekend. Stay in touch this week as we hone in on that part of the forecast. Really, it is the only unsettled part of the 7-Day forecast though as clear, cooler conditions will return beyond that front into the upcoming weekend. The Mississippi River: At Baton Rouge, major flood stage continues with a level of 40.1’ as of Monday morning. Peaking at 44.1’ on March 19, the river set its 7th highest recorded crest at Baton Rouge. In addition, at 99 days this is now the 3rd longest period above flood stage. River flooding and drainage north of the area will keep the river steady over the next several days. The high water is primarily an issue for river traffic and river islands, although some inundation will continue unprotected low-lying areas. At the current level, the grounds of the older part of Louisiana State University's campus are soggy. This includes the area around the Veterinary Medicine building, the Veterinary Medicine Annex, the stadium and ball fields. The city of Baton Rouge and the main LSU campus are protected by levees up to 47 feet. Some seepage may be noted due to the long duration of high water placing pressure on the levees. As some of the Mississippi River diverts into the Atchafalaya River, gauges at Krotz Springs and Morgan City will stay high as well. This creates backwater flooding in parts of Assumption Parish in areas such as Stephensville and around Lake Palourde. Like Big Muddy, this is expected to be a prolonged event but is not uncommon for the time of year. Read more HERE. An area of high pressure across the central Gulf Coast will keep pleasant weather in place through Wednesday morning. 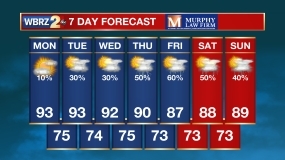 By the time it reaches the Carolinas on Wednesday afternoon, onshore flow will commence allowing some moisture return and high temperatures in the 80s. In the meantime, the next storm system will develop in the Southwest U.S. Initially, clouds will lower and thicken late Wednesday but we should remain precipitation free until at least the nighttime hours. The upper level trough and surface low pressure will pass farther north than those of last weekend’s event and this typically leads to less favorable atmospheric wind profiles for severe weather—especially tornadoes. However, warmth, moisture and instability could mean some gusty winds occur with storms as a squall line passes the region. Thursday should work out to be an unsettled day with rain chances looking highest during the afternoon at this point. 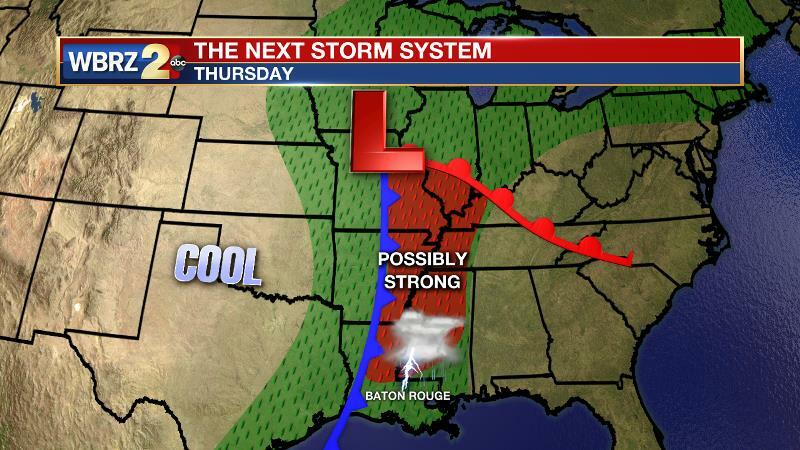 The system will exit on Thursday night with rain ending from west to east. Temperatures will briefly cool below average through Saturday morning but clear seasonable weather is then anticipated into early next week.